With video games becoming so ubiquitous now, and kids from the ages of 3 to 13 spending so much of their time on them, it might seem like you’re getting further away from their interests. Don’t fret though, because we’ve compiled a list that we believe both you and your kid will love playing. Sure, it will mostly be frustrating for you, but it will be great fun for your kid and with acceptable content. Most importantly, it will give you more time to bond with and enjoy your time with your child. Right off the bat, the first suggestion has to be Nintendo Labo. It’s actually a really unique and brilliant ‘game’ created by Nintendo and it’s basically just a constructor set made out of cardboard. 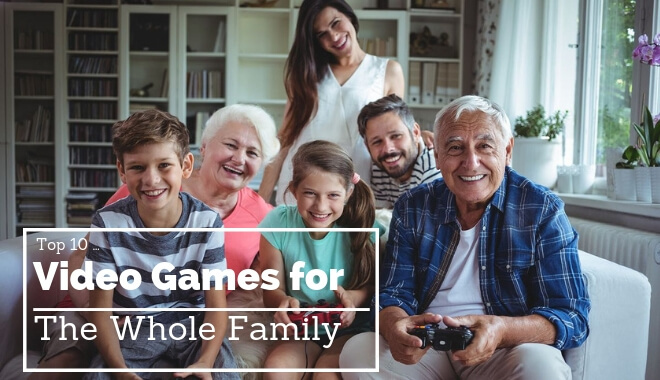 That means you can spend lots of fun time with your kids putting the cardboard pieces together, as well as enjoying the actual games that go along with the completed sets. Granted, you will have to dish out for a Nintendo Switch, as well as the actual Labo games. Currently, they have two versions; Toy-Con 1 Variety kit which goes for $70 and the Toy-Con 2 Robot kit which goes for $80. That’s right, you can build a cardboard robot with your kid! The games themselves are actually pretty simple, things like fishing games, piano playing, and motorbike racing. But the games aren’t as important as the actual experience of building and spending time with your children. One warning though, the Labo is made out of cardboard, so it’s likely that your kids will destroy it at some point. Yes! They do actually have a ton of Lego Games based off the Lego movies and other movie franchises. Batman, Harry Potter, Jurassic World, Marvel, Star Wars, Indiana Jones. The list really does go on and on. Even more than that, there’s also Lego games specific to the Lego universe, such as Ninjago. The majority of Lego games have a co-op mode which allows you to play along with your young loved one. Of course, quite a lot of that time is going to be spent in frustration, since there is PvP damage, and for some reason, kids just love to smash things up without a moment’s thought of cross-fire. But, if you can get past that, you actually have a ton of games you can play with your kids. This is actually a sweet little game about robots growing large, space-reaching plants. It’s a platformer, and there’s no damage from falling, so you shouldn’t have any hesitation when it comes to handing them the controller. Of course, we are talking about kids playing platformers, so it’s likely you’ll be spending most of the game time falling and climbing back up. But hey, it really is all about the fun! One of the slightly more challenging games which could help teach problem-solving skills. It’s very likely you haven’t heard of this game, since it’s massively underrated. Most of the game involves trying to solve puzzles by ‘snipping’ or cutting out parts of your avatar to achieve the goal. Actually, it’s pretty hard to explain with just text, so check it out for yourselves, we’re sure your kids will love it! In complete contrast to Snipperclips, the chances of you not having heard of Minecraft is essentially zero. One of the most popular games for kids and tweens, this game should absolutely be something you take a look at. The great thing about Minecraft is that it can be played by essentially all ages. With smaller kids, you can play the sandbox ‘creative mode’ and just build stuff together, and with older kids, you can play the survival mode, where you’ll have to fight, dig and explore to survive. It’s actually pretty fun when you get into it. A more grown-up version of Minecraft, Roblox actually allows kids to create their own games, as well as play the games that other people created. It’s actually a great way to help kids develop creative skills and general skills as well. There’s almost no need for programming, since it’s an object-oriented language, and you can import everything you need. Roblox also allows people to sell their creations, so you can buy games, or sell your own. A word of warning though, sometimes inappropriate or adult content might not get caught by the moderators, so it’s important to supervise their playtime. Mario Kart has been around for ages, and the latest installment is just aces. The controls are easy and the tracks are simple (but super fun! ), so it’s easy for kids and adults of all ages to pick up. There’s a Deluxe version out now on the Nintendo Switch, which should be the one you get if you have the option. This is one of the better and critically acclaimed party games out there. The premise is simple: You have to cooperate with the other players to cook a specific type and number of dishes before the time runs out. The twist? The stages are alive! You’ll be screaming, laughing, maybe even crying in frustration, but the truth is, this game is really fun regardless of what you’re doing. Sports games are actually great for playing with older kids and tweens. We singled out FIFA because it’s not a contact sports game (like NFL) or prone to aggression (like NHL). Related: Do Video Games Really Make People Violent? That being said, if your kids are old enough and you feel comfortable with letting them play those games, then you absolutely should. I mean . . . rocket-power cars playing soccer (or football if you’re not from the US). We’re not really sure much more needs to be said.